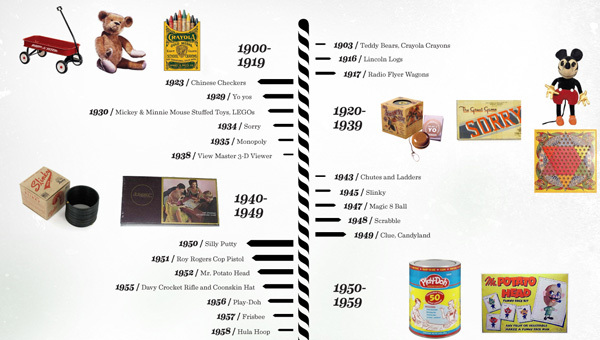 This timeline infographic indicates which toys created Christmas crazes over the last century, from yo-yos to the Microsoft Kinect. As much they’re not exactly brimming with creativity, I do find I get a lot out of timeline infographics. I suppose a straight list of toys and their years would have communicated the same information, but I think it’s important to see the images and be reminded of them. The all-or-none part of my brain wants an image for each of the mentioned toys, but I guess I’ll be content with what I was given. I’m not sure the list is really completely complete, as I’m noticing a few missing items like the Pong and Webkinz. Overall, though, I won’t complain much, since there’s quite a lot there. I find the style is missing something, though. I don’t really see any unified a artistic perspective, and while the central black pole like thing helps to distribute room for the images and names of toys, I can’t really figure it out if it’s supposed to be something to do with Christmas or Black Friday. If I have missed something, let me know! 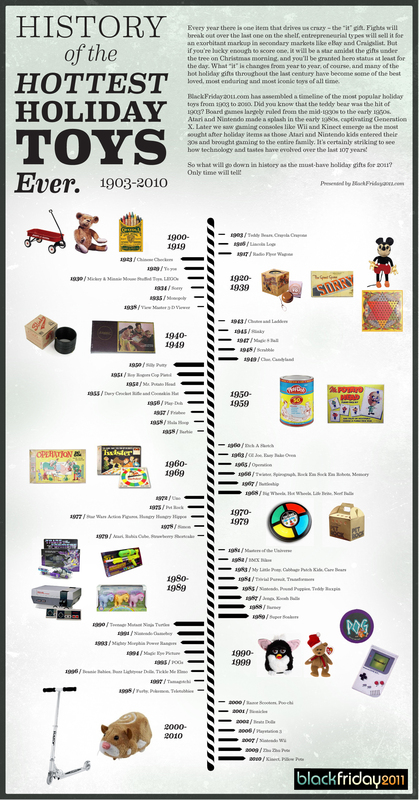 This infographic was created by Black Friday 2011 here. This entry was posted on January 7, 2012, 8:31 am and is filed under Entertainment. You can follow any responses to this entry through RSS 2.0. You can leave a response, or trackback from your own site.